International visual effects company Pixomondo completed over 800 shots as the primary visual effects vendor on Martin Scorsese’s 3D epic adventure, Hugo. Independently produced by GK Films and distributed in the U.S. by Paramount Pictures, the film features shots contributed by ten of Pixomondo’s eleven facilities across Germany, the US, Canada, China and the UK. Pixomondo’s 24/7 global pipeline was instrumental in completing the project on time and budget while keeping up with the highly inventive creative vision of director Martin Scorsese and visual effects supervisor Rob Legato. Brickyard VFX recently completed visual effects work for ESPN 2's "Afternoon Block" campaign via agency Wong, Doody, Crandall, Wiener and director Robert Boocheck of Oil Factory collective Tomorrow's Brightest Minds. 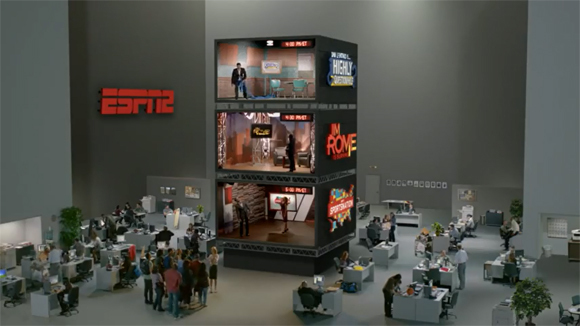 The campaign promotes ESPN 2's new weekday programming block of Dan Le Batard is Highly Questionable, Jim Rome is Burning, and Sportsnation, and features :30 spots "Power Outage," "Delivery," and "Tour Guide." Artist owned and operated bi-coastal effects boutique Brickyard VFX recently completed a series of spots for Toyota’s “2012 Camry Reveal” web campaign that launched on August 23. “Hole Shot” and “Combo” also required compositing multiple plates together since the center Nascar vehicle was fishtailing and needed to be aligned with the other cars. 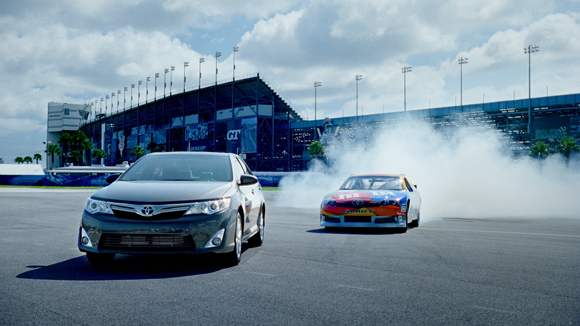 VFX Artist Patrick Poulatian also expertly composited the black hero Camry’s grill for a seamless transition between the cars thundering down the track and the final lineup. Lastly, for “Donuts” the Brickyard team added CG smoke to fully obscure the Nascar car, and then added lightning to give the transformation from Nascar to the re-invented 2012 Camry a magical touch. Brickyard’s VFX toolkit included Autodesk’s Smoke, Flame and Maya. In the latest campaign for Toyota Prius, Saatchi & Saatchi LA partnered with Eight VFX to introduce a new character: People Person. The spot, "Family," is a triumph for production in its ability to tell a story using a variety of visual effects, some technology based and others human-engineered. To bring the ambitious spot to life, director, Mr. Hide, and production company, The Sweet Shop, teamed with Santa Monica-based company Eight VFX, whose founders Baptiste Andrieux and Jean-Marc Demmer have built an industry-wide reputation for inspired work in commercials, film and TV. "We began the job back in March, and our team never lost its inspiration for the project and our affection for the character," said Eight VFX Executive Producer Shira Boardman. "Mr. Hide was coming to LA to shoot this and he wanted a company that he could trust technically, as well as partner with creatively." The spot tells an ordinary tale - a man wakes up, brushes his teeth, has breakfast and heads off to work - but the spot is anything but simple in its imaginative telling. The man is actually composed of all the members of his family who together make up the giant cartoonish figure. And when he finally emerges from his front door and looks at his driveway where the four Prius hybrid models-the third generation Prius, Prius Plug-in, Prius v and Prius c concept vehicle-are neatly lined up, the various members disentangle themselves from the figure and walk over to the cars and then drive off down the neat, suburban road. And to create this end shot, the neighborhood was shot as a miniature, while all the Prius cars are CG. "We began with some drawings and then began to build it all in CG, so we could really figure out how it was all going to fit together and what the people person would look like," said Demmer. To create the effects, Eight VFX did an initial pre-vis, to help create a blueprint for how the spot would actually be shot. The next step was designing and creating the two rigs that supported the people functioning as the main figure. The first rig consisted of the man's head, torso and his arms. The second rig included the legs and feet. The pre-vis was also vital in helping Demmer and his team determine how best to handle scenes where the people person interacts with props - an alarm clock, door knob and newspaper. "The pre-vis helped us decide what to shoot in miniature, what in real scale, and what needed to be built in CG," said Demmer. "It helped us break it all down and plan a very complex shoot." The spot took five days to shoot at Universal Studios. Eight VFX had a team of five on the shoot daily, supervising every technical aspect, including compositing shots in real time to ensure the projects success. Demmer and his team of 22 spent over ten weeks replacing, reshaping and creating CG people and body parts, as well as fine-tuning and cleaning up all the various elements. "We're huge fans of Mr. Hide and his work, so it was such a real pleasure to collaborate with him on this," said Demmer. "It was a great opportunity to combine miniature sets with oversize props, CG and real people." Bunkspeed PRO™ 2012 combines the best of our previous Bunkspeed SHOT PRO™ and Bunkspeed MOVE PRO™ into a single integrated system featuring the NVIDIA® iray® 2 raytrace engine, a full keyframe animation system, and cloud based asset library, simplifying the 3D rendering and animation process, and shattering the barrier to create "Hollywood" quality content. Eden FX Completes All VFX And CG Character Work On First Season of New Hit MTV Series "Teen Wolf"